As regular readers of this website and followers of this website’s Twitter and Facebook accounts know, after starting this website, I subsequently also became the chief sports news correspondent of the Mail on Sunday. It goes without saying this is a simplified version of events. But it was state-sponsored doping, authorised and effectively rubber-stamped by Russia’s government, by president Vladimir Putin, and by a variety of his political appointees. A summary is here. WADA’s most recent McLaren report about the matter is here, or downloadable in PDF form here: McLaren report.compressed. In Spring 2013, she was not completely sure how to handle a random response from a Russian stranger about what sounded like amazing claims about doping. She talked to Popov via email, then Skype, fortuitously with the help of a Russian-speaking work experience* intern. The story appeared and at different points later in 2013, the Mail on Sunday did follow-ups and nobody else did anything. That isn’t to criticise fellow media. I’m well aware this was, certainly then, an esoteric story and difficult to do as a ‘pick-up’ without the original sources and material, especially when it was presented ‘straight’ and not with unsubstantiated front-page claims to garner ‘mainstream’ attention. 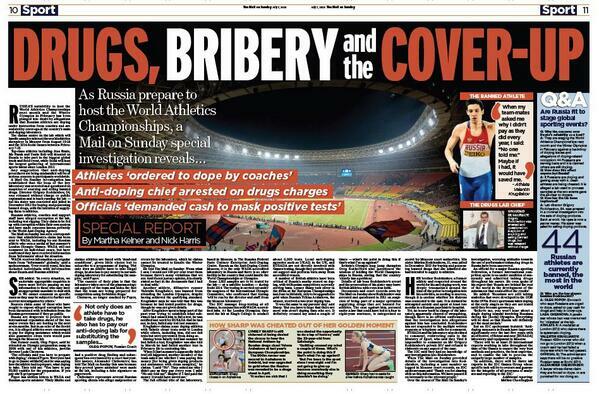 Some outlets have hyped doping stories that have later been shown to be at best exaggerated and at worst untrue. That serves nobody’s interest, not that exposing real corruption, with proof, will necessarily lead to swift action. Russia, and in particular sports minister Vitaly Mutko, responded by denouncing the story as western politically-driven propaganda, ignoring the fact that every key source was a Russian sick of institutional cheating. Scandals that sit in plain sight can go on for years or even decades without being resolved; we know that. The bribe-based award of the 2018 and 2022 World Cups to Russia and Qatar is one example; so too the corruption in FIFA from multi-billion ticket fraud over decades, the behaviour of countless senior officials, the buying and selling of elections and the conduct of dodgy ExCo members like Sheikh Ahmad Al-Sabah of Kuwait (more of that here) – one of the world’s most significant sports power brokers, who, incidentally, got Thomas Bach elected as IOC president in 2013.